For the first time in 2010 Toro Rosso had to build its own chassis. Technical director Giorgio Ascanelli explains that when you haven't got huge resources you have to lay down the chassis patterns relatively early, much more so than the top teams and at the time the team did that in 2009, the wind tunnel wasn't working and they didn't know how to use CFD properly. Toro Rosso used the tunnel used in Bicester, England by Red Bull before the parent team changed to another facility in Bedford. "It was a bit like a used car," Ascanelli says, "temperamental and it didn't come with a user's manual!" Ascanelli says that Toro Rosso carried over as much as possible from the '09 car and made some educated guesses, which were not perfect. "They were conditioned by the chassis, which was long and thin, with rear wishbones shaped for the double decker diffuser. We suffered a bit because there was not enough diffuser inlet because our gearbox was very short. It was the wrong choice of volumes in the end. Overall though, the car wasn't bad. I think we understood this year's tyres earlier than most and that explained why our performance improved after the first month's testing. "Through development we made a couple of changes that were positive but were extremely slow in producing them mainly because the CFD tells you something, the tunnel tells you something that may be the same or different and then the circuit tells you something else! "One development package came in Turkey and one in Hungary and the latter came out wrong in the diffuser area. Something didn't quite go from aero to drawing office and unfortunately I didn't see it. I saw it on the circuit and said, 'that's not going to work...' It's difficult to handle an operation with the wind tunnel in England and the drawing office in Italy." The team was still in the process of upgrading to its new manufacturer status. They took on 30 aero staff, doubled the size of the drawing office and had to start a structural department from scratch. "Some of them have already left!" jokes the amusing Ascanelli, "...maybe I'm not easy to work with!" The team did a blown floor, completely in CFD, but as Ascanelli says, it took time. They weren't entirely convinced by their diffuser, which was prioritised, but they worked on the blown floor in preference to an F-duct simply because the exhausts have carry-over to 2011. "The F-duct is a difficult exercise. It works with CFD, it works in the tunnel, but it's a nightmare in terms of implementation -- accuracy of parts, leakages and unwanted flexibility changing the shape of the orifices. I think the best race for the F-duct would have been Spa but we weren't in time." 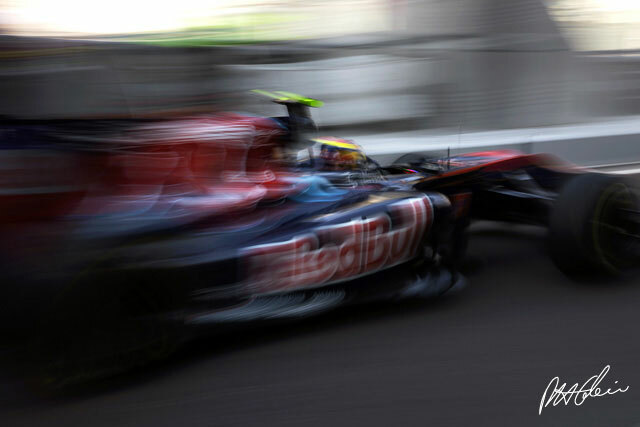 The team exists, of course, for Red Bull to evaluate its most promising young driving talent in the F1 arena. With testing restrictions making it ever more difficult for the inexperienced, Toro Rosso continued unchanged, with Sebastian Buemi and Jaime Alguersuari. "Alguersuari progressed," Ascanelli states. "More than anything, he's now fit. In 2009 he wasn't. He's stronger and now a very good racing driver." Then, looking at his slimly built young charge, adds, "he doesn't know how to brake yet --- look at his legs! But I think he knows that and is working on it. "Sebastien was surprised by a team mate he expected to be far from him but wasn't. I think he had a couple of races where he couldn't handle it then got a grasp of it. Unfortunately that period coincided with us running out of steam in terms of development. Williams and Sauber messed up their Barcelona package and went backwards instead of forwards, so we looked good, and then they got their acts together. Seb had his drop-off at that moment and it hurt us a bit. "A general comment is that every time they had to choose whether to risk something or preserve what they had, they preserved. I think that's conditioned by the lack of testing, so that if they cause a stoppage of the car it's simply less miles, which they need. It's understandable but thinking like that makes it hard to take a step forward." The 2011 car, Ascanelli says, will be a bit different, also with a few more risks taken. They hope they are in a slightly better but the Pirelli tyre is an unknown for everyone. "If I don't take any risks it will be another year being ninth. If we're ninth we've just done our job - not good, not bad. If we're 10th we deserve to be shot and if we're eighth it's extraordinary!"